The software makes easy your email list management and distribution ! 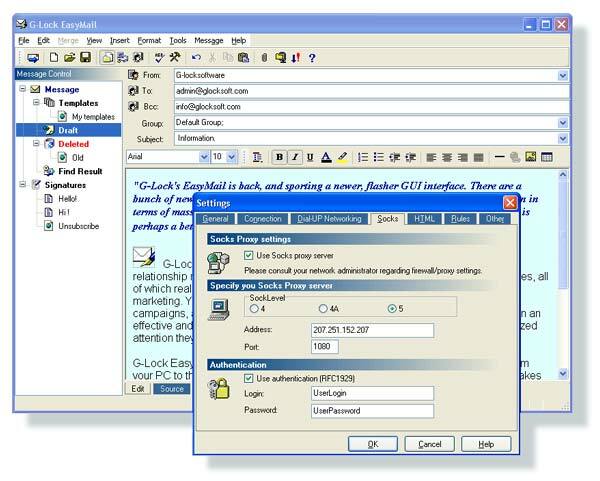 G-Lock's EasyMail is a fast, powerful yet simple to use email software designed primarily for applications in which the sender and recipient have an existing relationship, a retailer's customer base, a physician's list of patients, a newsletter publisher's subscriber list, and an insurance agent's client roster. The software makes easy your email list management and distribution. Ability to have duplicated email addresses within the same contact group (optionally). Ability to have the workplace (Address Book, signatures, templates, Send Manager) on any hard disk (including network drive). Ability to schedule the date of message sending Ability to import email addresses from HTML, Lotus 1-2-3, Quattro Pro, XML and MS Access files Ability to import from ODBC compatible databases. 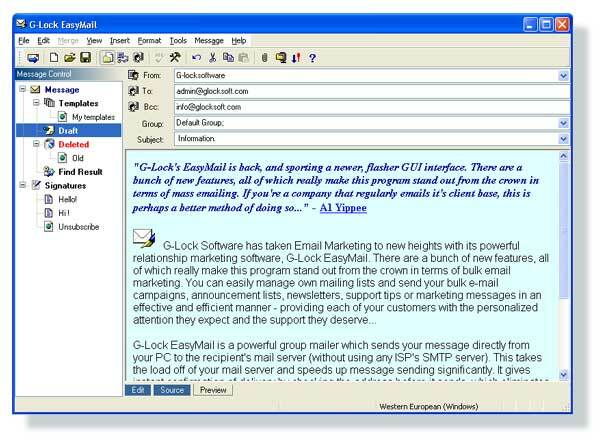 G-Lock Software has taken email marketing to new heights with its powerful relationship marketing software, G-Lock EasyMail. You can easily manage your own mailing lists and send your group email campaigns, announcement lists, newsletters, support tips or marketing messages in an effective and efficient manner - providing each of your customers with the personalized attention they expect and the support they deserve. allows you to send highly customized messages - including personalized message bodies and subject lines and supports Multi-Part (MIME) message capability can send Multi-Part messages that contain formatted text, HTML, (fonts, bolding, colors, etc. ), attached files, and embedded objects to other users even if they use a different email application. 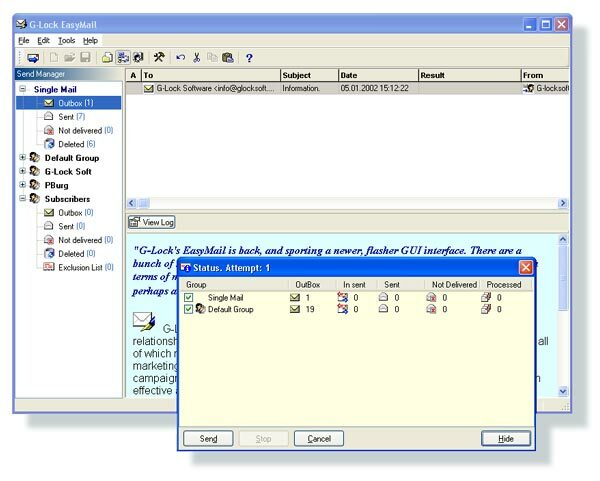 a powerful group mailer that sends your message directly from your PC to the recipient's mail server (bypassing the requirement for a SMTP server) and includes multi-language spell checker, a voice mail facility with a wide range of compression formats to record in and Drag and Drop facilities include attachments, text files direct to the message body and you can Drag and Drop a message you want to reply to from Outlook Express! 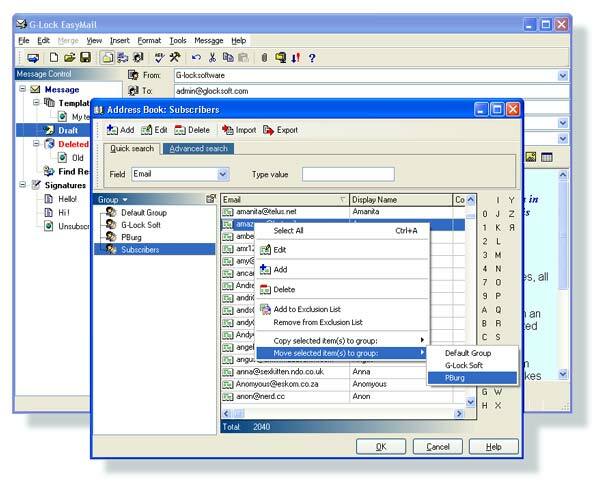 EasyMail, is a 32 bit Windows Program for email marketing. It is intended for easy and convenient sending emails to large mailing lists (up to 50 000 recipients in each group), . Mail merge capabilities. You may send highly personalized message to members of the whole group in your Address Book, the software generates a customized email to each recipient. Full HTML support .Fully-featured context-sensitive message editor. Ability to use an external SMTP server for relaying. Supports attachments to the messages (drag and drop). Supports compression of all attached files in one ZIP-archive (AutoZIP) Allows to get delivery and reading confirmation. Full control of the Address Book fields: ability to add/remove custom fields as well as switch on/off standard fields. Speed Maillist Verify - E-mail addresses and mail lists verifying. Spytech SpamAgent - Professional anti spam filtering software. SpamWeed - Professional anti email spam filter. Spam OFF - Anti-spam tool designed work invisibly for Spam stop. Web Email Checker - Enables you to check all of your web email.